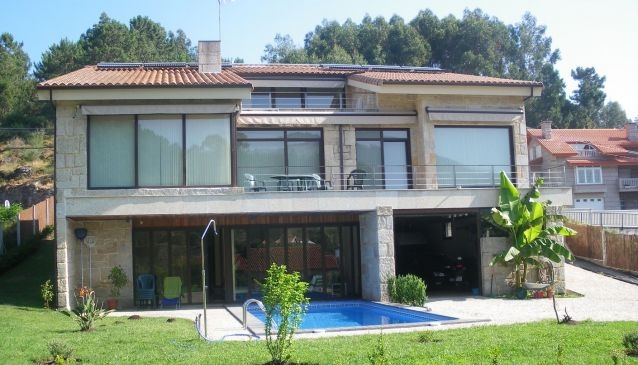 Magnificently constructed in local,recovered stone using materials of extraordinary quality, this is 4 -bedroomed nearly new energy efficient villa (about 600 m2). There is under-floor heating which is of minimum energy consumption. There are solar panels and geotermal energy. The villa has two spatious living rooms, one of which is semi-integrated with the outdoor swimming pool and the property also boasts two kitchens. The main floor is open plan with adapted toilet. There are two laundry rooms, an office and machinery equipment store. There is also a centralised air-conditioning system, a swimming pool and garage for 5 cars. The villa is set in a large, landscaped garden with plenty of development potential (total plot size about 1850 m2. The price is negotiable. The property is only a few minutes away from the sea and from the centre of Baiona, one of the principal tourist resorts in Galicia which has plenty of attractions,services and facilities. Vigo airport is only 30 minutes drive, Santiago and Porto airport are an hour away.